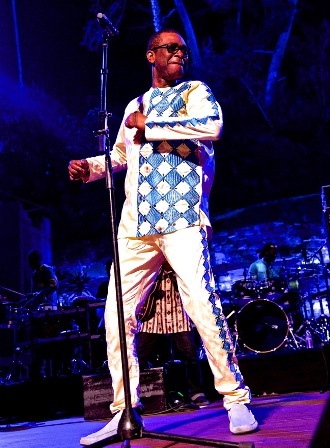 The heart and soul of Senegal, West Africa were on pulsating and vibrant display Sunday, August 6 in the Hollywood Hills when international superstar Youssou NDOUR brought his sprawling ensemble of musicians, singers and dancer to town. NDOUR. Arriving on this first stop in Southern California in over 6 years, NDOUR was touring in support of his 34th and most recent recording, Africa Rekk (“Africa And That’s Final!”) - his first CD in six years following highly honorable service as Minister of Tourism followed by Minister of Culture under President of the Republic of Senegal: MackySall. Once NDOUR’s status shifted to Minister Advisor to the President, he was liberated to once again bring his soul-stirring messages of spiritual grace, gratitude and love to fans around the globe. NDOUR would have had the whole house on its feet from the first buoyant number had everyone in the multi-cultural audience known what to expect. However, once the star insisted that the ushers chill out so everyone could feel free to dance, sing and participate as the spirit moved them, it was near impossible to the majority of the crowd in their seats. Steeped in a river of rhythm from his 4-man percussion and drums section, the music united the audience into a sea of joy…a combination of both jubilant and salacious feelings. Melding the messages of his heart with the music of Mbalax (pronounced “em – bah – lah”), a traditional music of Senegal, with his pop crossover classic of conscience “7 Seconds” (made famous in a duet with Neneh Cherry but sung this night with Babacar FAYE), NDOUR captivated the crowd for nearly two hours of music. NDOUR also performed his two latest singles. The first, “SerigneFallou,” finds him carrying a metaphorical torch of wisdom for the generation behind him depicted as modern dancers. The second, “Be Careful,” delivers a message to young girls to be wary of insincere men and boys who would toy with their hearts. Almost as riveting as NDOUR was featured dancer Moussa SONKO, a locally based master who changed colorful clothing ensembles several times to come down front from the drum section to engage in hyperkinetic movements across the stage and into the aisles. So lifted was the audience that after giving NDOUR a 5-minute standing ovation, the band broke house curfew to play two more songs. NDOUR does not tour often. Should L.A. be granted another visit, it is strongly suggested that lovers of uplifting music suitable for all ages and generations make a special trip for this Senegalese experience in their own backyard.